The Winter Raffle jackpot winner was 92 years old Mrs Nevet from Hull. She has been supporting Dove House through the lottery for 20 years in memory of her daughter. Mrs Nevet is considering whether to spend her £2,019 win on her cruise or a donation back to the hospice. She enjoyed her tour of the hospice seeing how the services have developed over the years and what her support meant to Dove House. The Winter Raffle raised a fantastic £30,201 which will go towards the many services Dove House Hospice is able to develop and run free of charge to those requiring the support of the hospice care teams. A huge thank you to everyone who took part in the Winter Raffle. Mr Kerry won the £1,000 prize jackpot prize in draw dated 1st March, 2019. Mr Kerry has played the Lottery for 18 years and this is his fourth win during this time. Mr Kerry’s family have had first had experience of support from Dove House back in 1996 and noticed how the hospice has changed since as he and his wife had a tour of the hospice facilities. Mr Kerry stated that his support of the hospice through the Lottery is something he was determined not to stop. He and his wife have agreed to participate in the Change for Care Appeal and took a personal collection box with them to collect their loose change in support of Dove House. Miss Melling was our lucky jackpot winner on 19th January. On collecting her cheque she also had a tour of the hospice with her friend Andrea. 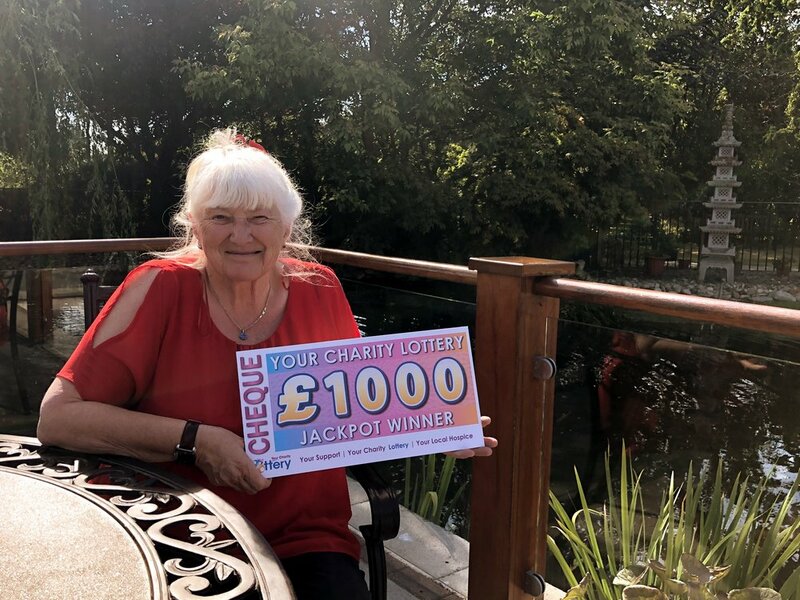 A retired nurse from Hull Royal, she started supporting Dove House through the lottery 10 years ago. Many of her previous colleagues now work at the hospice and she wanted to support ‘a place that helps everyone’. She was impressed by the facilities and how much was going on. She met some of the day patients in the Amy Johnson unit who were busy decorating boxes and playing dominoes. Miss Melling and her friend also observed a group physio therapy session in the gym. Her friend Andrea, who accompanied her, had been a volunteer at the hospice for 10 years previously and was pleased to see the changes so generously funded by supporters. 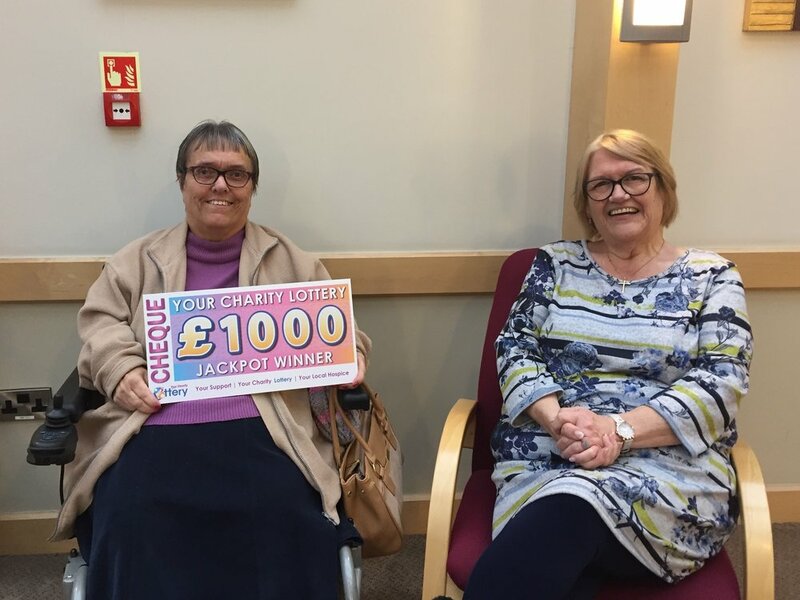 A previous lottery player herself she decided to re-join the lottery after seeing how crucial support is to a wide range of people from in-patients, their families and also people using our outpatients’ services. Miss Melling enjoyed her tour saying: ‘It is such a wonderful place. It doesn’t feel like a hospice at all. Everyone is so friendly, warm and welcoming, it feels more like a home where you visit friends. I wish more people would come to visit’. She will use her winnings towards a 2 week cruise around the Mediterranean with her friend Andrea. Congratulations to Mr Redhead! He was one of our lucky jackpot winners in the August weekly draws. Our early bird Summer Draw prize has been won by Jeanne Davis!